Lawmakers Have Taken Millions From Groups That Disagree On This Issue. Now, They May Have To Weigh In. A Looming Debate Involves Some Of Michigan’s Most Active Interest Groups. It’s Over Michigan’s Prevailing Wage Law, Which Sets Wage Standards For State-Financed Construction Projects. LANSING — It could be the next battle in the struggle between powerful pro-business groups and powerful pro-labor groups. This one has an added wrinkle: The labor groups with the most to lose have a record of financially supporting some Republicans. There’s money at stake. There’s money at play. And the ultimate decision could rest with about a dozen GOP lawmakers who’ve taken campaign contributions from both sides of the disagreement. 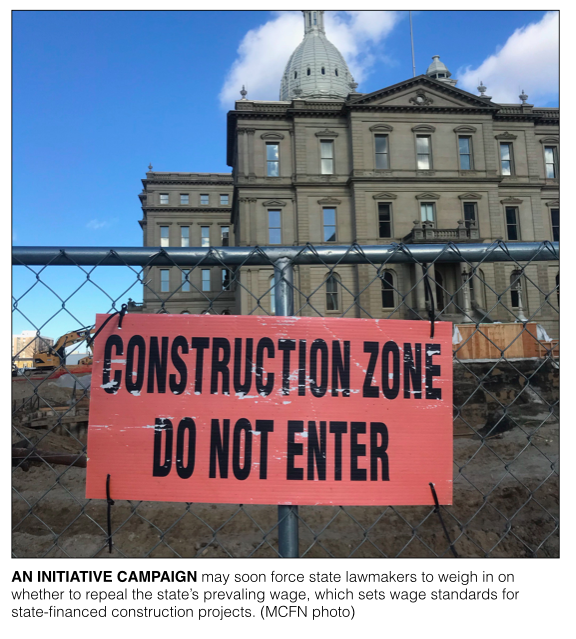 It’s the fight over whether to repeal the 52-year-old Michigan law that sets wage standards for state-funded construction projects. Under the prevailing wage law, the standards are based on wages for other projects in the area that were collectively bargained. The debate could come to a head in the next months as the Secretary of State’s Office verifies whether a petition campaign to repeal the law gathered enough signatures to send its repeal proposal to the Legislature. Lawmakers could then approve it, repealing the law, or decide to leave it up to a statewide vote in 2018, setting off a potentially expensive fight to influence voters. One detail is certain: Current state lawmakers have taken millions of dollars in campaign contributions over the years from interest groups with opinions on the subject. 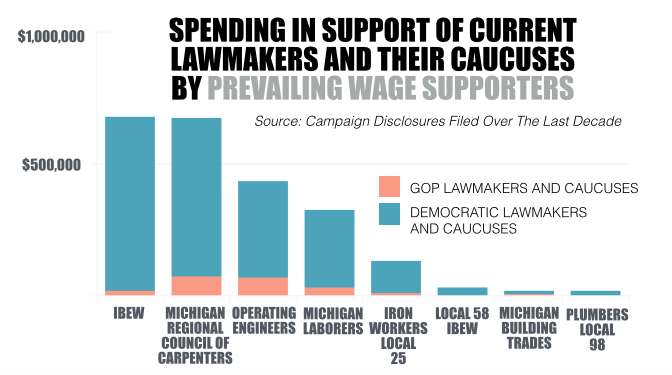 Eight political action committees (PACs) connected to groups that have previously supported repealing the prevailing wage law have spent about $2.28 million in support of lawmakers currently serving in the Legislature and their caucuses over the last 10 years. Supporters of repealing the prevailing wage usually argue that the law unfairly increases the cost of construction projects for taxpayers. Eight PACs connected to groups that previously opposed repealing the law have spent about $2.29 million in support of lawmakers currently serving in the Legislature and their caucuses. Supporters of the current law argue that repealing it wouldn’t actually save that much money and would lead to a shortage of needed skilled-trades workers. Supporters announced on Thursday that they’ve launched their own ballot proposal campaign aimed at gathering enough signatures to ask voters to keep the law. MCFN developed the list of groups to track based on committee testimony from 2015 when the state Senate considered bills to repeal the prevailing wage law and based on giving to campaigns supporting and opposing the recent petition drive to repeal it. Former state Senate Majority Leader Randy Richardville, a Republican from Monroe, says the debate over the prevailing wage is different than past disagreements between businesses and labor, like over Right to Work. Richardville was the Senate GOP leader when Michigan became a Right-to-Work state in 2012, a move he supported. But his candidate committees received more than $25,000 in contributions from building-trades groups, according to campaign finance disclosures, and he supported keeping the prevailing wage law. 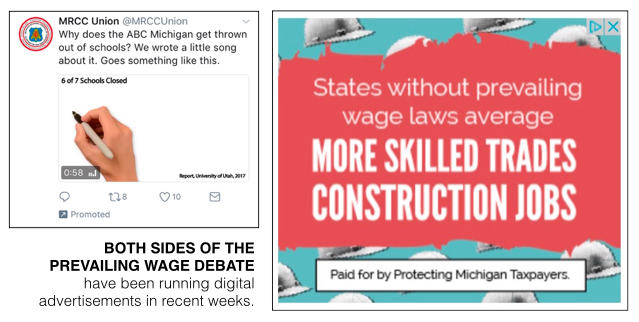 Although Richardville predicts the repeal initiative will pass if it gets to the Legislature, he believes the prevailing wage law prevents out-of-state workers from coming into Michigan and taking Michigan jobs and prevents illegal activity, like under-the-table payments. Organizations that share Richardville’s support for the law include labor groups in the skilled trades and whose members work on state-funded construction projects. The biggest donors on this side of the debate have been the PACs of the Michigan Regional Council of Carpenters — giving $665,700 over the last 10 years in support of current lawmakers — and of the International Brotherhood of Electrical Workers — giving $677,975 in support of current lawmakers. On the pro-repeal side, the most active donors over the years in support of current lawmakers have been the the PACs of the Michigan Chamber of Commerce and the Associated Builders and Contractors of Michigan. The Michigan Chamber’s main PAC has given about $1.0 million to current lawmakers, their leadership PACs and their caucuses over the last decade. Its Super PAC has spent about $473,376 in support of them. The Associated Builders and Contractors PAC has given about $225,467 to current lawmakers. The group’s Super PAC has spent about $50,123 in support of current lawmakers. The Associated Builders and Contractors spearheaded the recent petition drive to repeal the prevailing wage law. The organization provided about $1 million in funding for the campaign that gathered more than 380,000 signatures. It needs 252,523 of those signatures to be valid for the proposal to go before the Legislature. A spokesperson for the Michigan Secretary of State’s Office, says signature verification is expected to be completed by mid-January. But both sides of the debate seem to believe it’s likely enough valid signatures were gathered to advance the proposal. And supporters of repeal could find many welcoming lawmakers in the Legislature. Of the $2.28 million the eight pro-repeal PACs have reported giving in support of current lawmakers over the last decade, about $2.25 million — more than 98 percent — has gone to current Republicans. Republicans control the state House and Senate. Top-ranking lawmakers, Senate Majority Leader Arlan Meekhof, a Republican from West Olive, and House Speaker Tom Leonard, a Republican from DeWitt, are among the top 10 recipients of the groups’ giving. Leonard’s committees have received about $46,300 from the eight PACs while Meekhof’s committees have received $69,100. As for PACs that oppose repeal of the prevailing wage law, they have heavily preferred Democrats who are in the minority. The PACs have reported giving $2.29 million total in support of current lawmakers and their caucuses. Of that, $2.10 million — about 91 percent — has gone to Democrats. Still, the eight PACs have reported spending about $188,628 in support of current Republican state lawmakers, according to MCFN’s analysis. The PACs have combined to give contributions to 30 current GOP lawmakers, according to the PACs’ disclosures. And six GOP lawmakers been given more money from PACs opposing repeal of the prevailing wage law than they have from the business PACs that support repeal, according to the disclosures. According to campaign finance reports released in October, the labor groups’ giving to Republicans has continued in recent months. The Michigan Laborers Political League gave $8,750 to Republican lawmakers’ committees this fall. The Michigan Regional Council of Carpenters gave $3,450 to Republicans. And the International Brotherhood of Electrical Workers gave $2,400 to Republicans. Between Aug. 10, 2017, and Oct. 20, 2017, the eight PACs had combined to contribute to the committees of nine different House Republicans. One of them is Rep. Jeff Yaroch, from Richmond. The Michigan Regional Council of Carpenters reported giving his campaign a $250 contribution in October. Yaroch said he’s been hearing from both the building-trades’ side of the debate and the Associated Builders and Contractors’ side. “It was brought to us by the people and people should probably vote on it,” said Yaroch, who described himself as a constitutional conservative. Among the state House Republicans who’ve received the most money from the anti-repeal PACs are Rep. Brett Roberts, from Eaton Twp., at $21,250 and Rep. Dave Pagel, from Oronoko Twp., at $11,000, according to campaign finance disclosures. The PACs reported giving $4,500 to committees connected to Rep. Ben Frederick, a Republican from Owosso, in September 2017 alone. The Republican state senators who have received the most contributions from the anti-repeal PACs over the decade are Sen. Mike Kowall, from White Lake, at $35,900, Sen. Tom Casperson, from Escanaba, at $24,250 and Sen. Tory Rocca, a from Sterling Heights, at $20,200. Those three were among the five Republican senators who voted against repealing the prevailing wage law when the Senate last considered the matter in 2015. The vote was 22-15 in support of repealing the law. Gov. Rick Snyder has voiced opposition to repeal. The petition process currently unfolding offers a way around Snyder, meaning the citizen-initiated repeal wouldn’t need his signature. But opponents of repeal remain hopeful that at least some Republicans in the Legislature, like Yaroch, will decide to put the repeal proposal up for a statewide vote in 2018 instead of approving it outright. Josh Pugh, a Democratic consultant who has worked with several building-trades unions, said there’s a solid bloc of “reasonable votes” in the House GOP caucus who’ve been willing to buck the GOP leadership on a number of issues. “I think a vote on prevailing wage would be close but ultimately the building trades should feel good about this failing in the House and going to the ballot next November,” Pugh added. However, proponents of repeal have invested heavily in the 2017 petition drive and another that came up short of the needed signatures before the 2016 election. They believe the votes for repeal will be there in the Legislature. For this piece, MCFN tallied independent spending in support current lawmakers, giving to candidate committees of current lawmakers and giving to other committees closely connected to current lawmakers, like leadership PACs and caucus committees. The following are the PACs whose spending was included in the tally. Against Repeal: International Brotherhood of Electrical Workers ($677,975); Iron Workers Local 25 ($30,686); Local Union No. 58 International Brotherhood of Electrical Workers ($131,788), Michigan Building and Construction Trade Council ($166,660); Michigan Laborers Political League ($324,200); Michigan Regional Council of Carpenters ($665,700); Operating Engineers Local 324 ($435,456); and Plumbers Union Local 98 ($15,060). A PDF of the tally of spending by groups interested in the prevailing wage is available here.